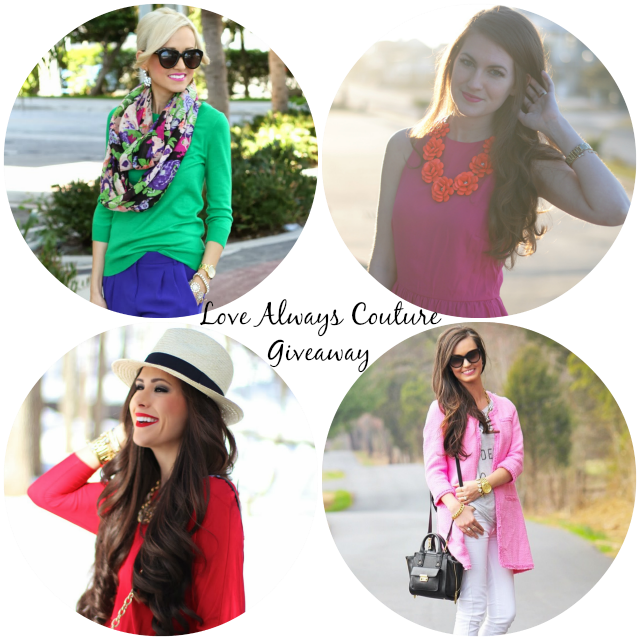 Love always has teamed up with me and 3 other bloggers to giveaway a monogram necklace!! The quality of this necklace is amazing. It is definitely one of my go to necklaces that I wear almost everyday! Use the rafflecopter widget below to enter! The more entries you complete the better chance you have at winning! A few of my absolute favorite bloggers getting together for a giveaway - so exciting! Y'all's styles are so inspiring! Love the mix of mint and navy! Would have never thought it would look so chic together! I am obsessed with that top! love, love, love your style! just recently stumbled across your blog and now I am anxious to check it out each day! Can you let me know how the cardigan washes? I'm on a never-ending quest to find nice cardigans that don't look terrible after 1-2 washes! thanks! Such a great look! I love the pop of color! Love the navy + green combo...looks great! I love the mix of mint and navy. I will definitely have to try it sometime! I love this color combo, mint and green. And this outfit is seriously perfection. It includes so many of my favorite things: mint green and polka dots! These are lovely shoes. I need to check out some Kate Spades, I guess! love that cardigan, so pretty. You can find her blouse at novaeclothing.com, click on special price. It is 24.99 right now. I have this shirt and love it!! Love the mint sweater with it! I love the color combo! Great outfit! I love those Camel colored heels, so cute!